The Bowflex multi-gym HVT is equipped with two unique features for a maximum training efficiency. At first, there is the combined resistance system with air and magnetic resistance. The basic resistance is generated by the magnet - the air brake generates the peak resistance. It's a progressive resistance system, that means the quicker the exercises are done, the higher gets the resistance. Hence, the training with the HVT multi-gym is always a challenge!
. These workouts do not take longer than 20 minutes, but still offer an extraordinary training effect. As these are a so-called High-Intensity-Interval-Training, the training effect last especially long. Even 48 hours after the training, the fat burning is higher than usual. 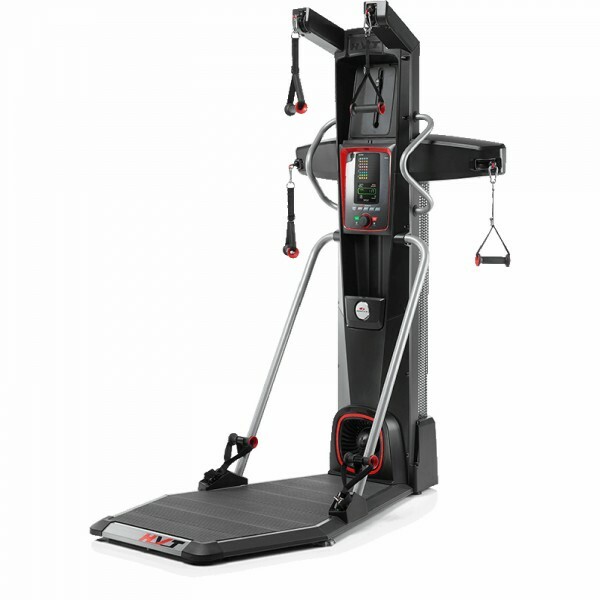 The Bowflex multi-gym HVT is equipped with two cable pulls each at the bottom, on chest height, and two overhead. Several exercises can hence be done. As the exercises demand differently the muscles, the basic resistance can be set in 16 levels. The resistance can be directly adjusted with a control knob directly on the machine. Here, the remaining duration of the respective exercise is shown. In addition, the Bowflex multi-gym HVT can be connected via Bluetooth with a compatible Android or Apple device and the free HVT App. Using it, more than 50 training videos can be shown. A coach guides you step by step and ensures that you do your training with a maximum of success. Bowflex multi-gym HVT add to comparison list.